The Bailys also owned a furniture shop (A J Baily) at 8&9 Walcot Buildings, on London Road. At the time of the air raids, Eileen, a teenage schoolgirl, lived with her family in a Georgian house that was No. 20 Snow Hill (about where the flats are now). With her was her father Albert Baily, her mother Lilian, her brother Edward (Ted), and her other brother Leonard (Len) who was home on leave from the Army and who was visiting with his new wife Doris (her home was in South Wales). When the air raids started on Saturday night the family took shelter in the cellars but no harm came to them that night. The next morning, Sunday, Len and Doris decided to make their way home. However due to the chaos in the city, there was no means of transport available so they returned to Snow Hill. This turned out to be a fateful decision. When the air raid alert sounded in the early hours of Monday morning, once again the family took refuge in the cellar; mother sat in an old armchair knitting, and father sat in an old armchair reading his paper, Ted sitting on a chair with his young sister Eileen on his lap, and Len sitting on another chair with Doris on his lap. These arrangements were to have devastating effects. 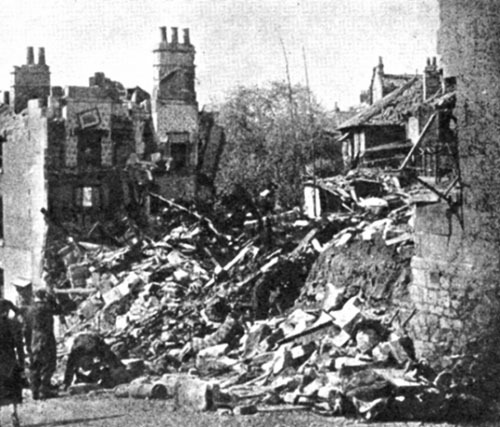 As Eileen remembered it, at one stage during the raid, the bomb explosions came even closer until suddenly she saw the roof of the cellar, which consisted of huge blocks of Bath stone, collapsing in towards her. Eileen lost consciousness for a while, but when she came to she was unable to move due to the weight of the heavy stone blocks which were pressing down on her. She could hear Ted calling to her. Edward was not badly hurt, having been protected by Eileen. However, he could not move, trapped under Eileen and the stone that had fallen on her. Unknown to Eileen at the time, her father and mother had both died instantly, as had Doris. However Doris's body had protected Leonard, and although he was very badly injured, he survived. Eileen remembered what made a great impression on her was the utter silence, except for the occasional groans from Ted, the trickling of dust, and ominously the sound of running water as there were water pipes in the cellar which were now leaking. Worse was to follow. Ted's groaning ended in a gurgle and it transpired that Eileen had heard him drown in the rising water. During the next few hours, Eileen was conscious all the time. She heard the all clear sound, and then after what seemed forever (actually three hours) she heard voices overhead, which heralded the arrival of the rescue squad. Then there was a voice from above asking if there was anybody there? Eileen replied "yes, there are five" then she remembered Doris "NO, six". The voice then said that they would soon have her out. She saw daylight as the huge block of stone lifted off her. Her rescuer then said in a gentle voice as he reached her "Okay sonny, we'll soon have you out of there" to which Eileen replied, "I'm not a sonny, I'm a girl". (That saying has gone down in family history). This rescuer was a Special Constable named Alfie Shepherd who became a friend in later years. Eileen and Leonard were the only survivors: they were taken to St. Martin's Hospital where they stayed for many weeks. It was only some time later that they were told that they were the only ones found alive. Eileen was very badly injured, with two broken arms, a broken pelvis and crushed chest, but she eventually made a full recovery from her injuries, though the mental scars took much longer to heal. After a long time in hospital Leonard recovered and rejoined the army and continued his life, eventually marrying again and raising a family. • Another photo in the same book showed the mourners at the mass graveside at Haycombe Cemetery. Standing by the grave was another of Eileen's brothers, her sister and their respective partners. • Finally the last coincidence was that on the day the Book of Remembrance was dedicated in Bath Abbey, the Chronicle published a photo of it open on its stand. The names showing on the open page were Eileen's family. Happily both Eileen and Len subsequently recovered from their terrible injuries and were able to live full lives and raise families.